Twelve South, makers of Mac accessories that are sometimes prettier than they are practical, have a new way for you to protect your MacBook or MacBook Pro: hardbound leather. Twelve South's products always look nice, but sometimes they don't make a whole lot of sense. BookArc? Sure. BassJump and BackPack? I'm not as convinced. But their new BookBook case considers both form and function. The BookBook has a hard shell and a rigid spine to keep your MacBook from being crushed, and is lined with soft fabric to keep it from being scratched. 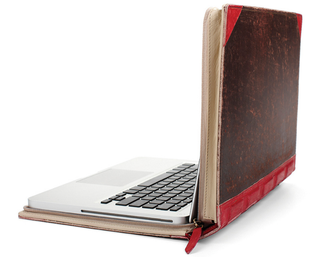 Twelve South also plays up the fact that by disguising your laptop as a beat up old book, you make it less likely to be stolen. Because who wants to steal an old book? Besides these guys. The leather cases are hand-distressed, so each tome is unique, and the cases have two zippers that are disguised as bookmarks to complete the illusion. These books look so authentic that you might even fool yourself into thinking that you've been reading an old hardcover book.